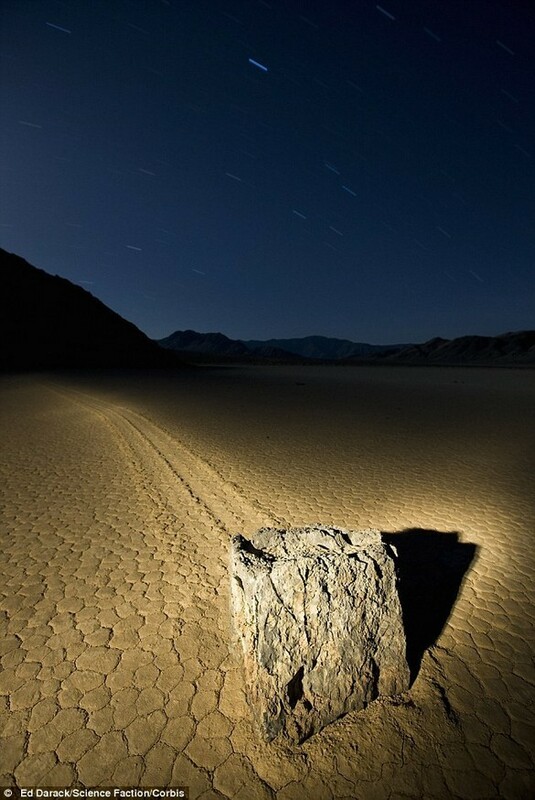 In the dusky, cracked surface of a dried up lake bed in Death Valley, California, the stones move across the desert all by themselves. 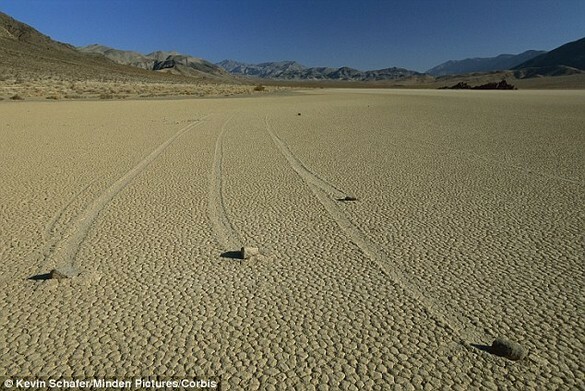 On the barren Racetrack Player, the rocks, some as big as 700 pounds, leave trails in the sand, marking their inexplicable movements. Some of the tracks are nearly 600 feet long. 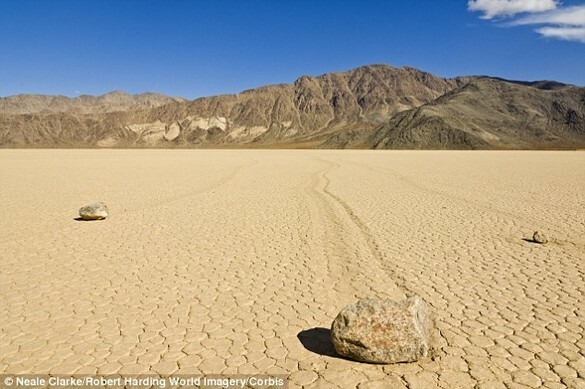 The 'magic' force behind these 'sailing stones' has been a mystery to scientists for nearly a century. Now, a NASA geologist believes he has finally found the answer. 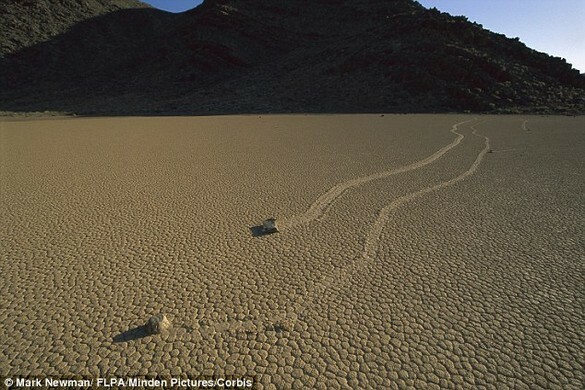 Professor Ralph Lorenz, a planetary scientist, believes the rocks become encased in ice during the winter, then as the lake bed thaws and becomes muddy, the ice allows the rock to 'float' on the mud - making them easily blown around by strong desert winds. 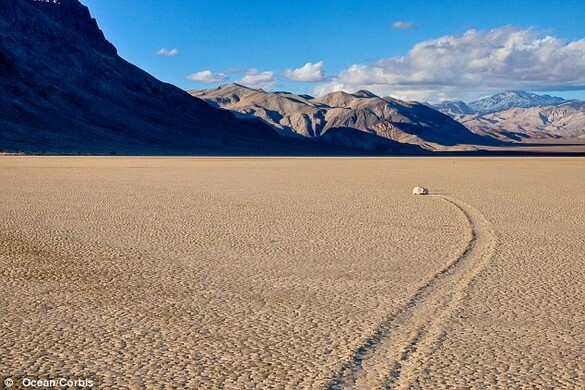 In an interview with Smithsonian magazine, he summarized his 2009 breakthrough this way: 'Basically, a slab of ice forms around a rock, and the liquid level changes so that the rock gets floated out of the mud. To date, no scientist has been able to record the rock physically moving. It is believed that no one has ever seen them in motion. Smithsonian reports that Lorenz devised his theory after a simple experiment on his kitchen counter. He froze a small rock in just enough water that a small amount of the stone was sticking out of the ice. He then flipped the stone upside down and placed it in a small pool of water with sand on the bottom. The ice allowed the stone to float just enough that it still touched the sand. Dr Lorenz found he could move the rock around simple by blowing it gently. 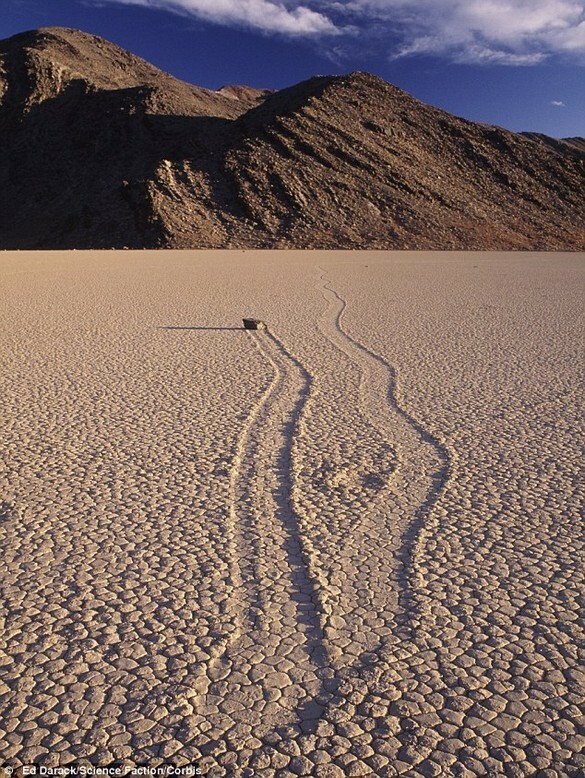 Previously, scientists have theorized that massive sheets of ice locked several rocks together and blew them through the desert. However, new mathematical models calculated that winds would have to be hundreds of miles an hour to push the rocks in this way. Dr Lorenz's theory indicates the rocks could move with only a slight breeze, under the right conditions, because the ice causes them to float - dramatically reducing their friction. 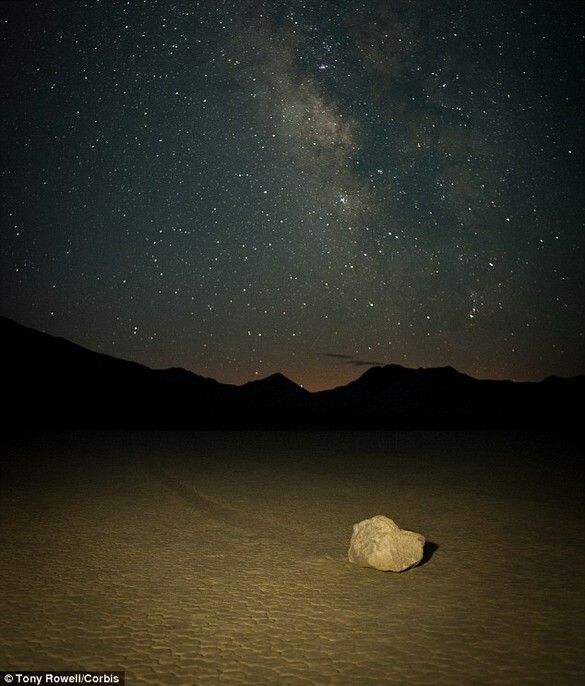 Despite this new explanation for the movements of the 'sailing stones,' park rangers say many visitors continue to attribute mythical properties to the rocks on the Racetrack Playa. Visitors have claimed magnetism, aliens and mysterious energy fields move the rocks. Some of the most superstitious believe that stones have magical properties. 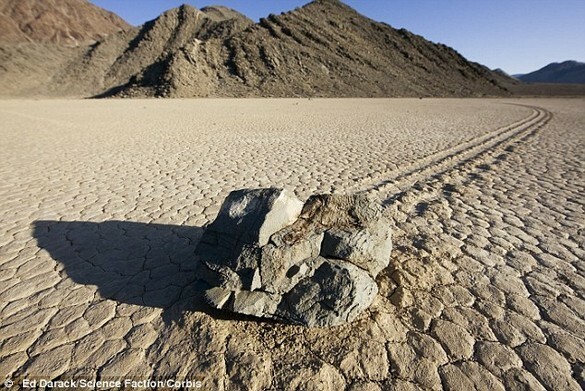 Last month, the Los Angeles Times reported that park rangers have begun investigating the disappearance of several of the stones.